Milestone Therapy | Programming, Programming, Everywhere! We hope you’ve been enjoying all of the updates to our website and social media over the past few months. Now it’s time to let you know what’s going on in the clinics over the next few months. Please check back to our Events page regularly for new offerings and times for the great updates below. Need more Milestone? Check out the previous blogs we’ve posted for more great news and information! We have several new programs that we will be getting up and running this year! The first program will be a Rock Climbing and Fitness Fun Night. 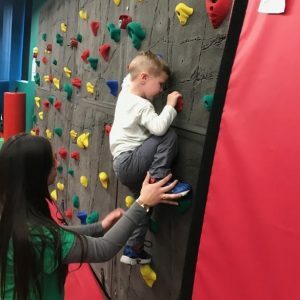 A Milestone physical therapist will be leading a class that will incorporate different exercises along with climbing our rock wall to improve strength, coordination, and motor planning. The sessions will be divided up by ability level to ensure the most success for the kiddos. More information in the near future! Pediatric Yoga will also be starting this year! Occupational therapists will lead this class to help improve strength, balance, coordination, and flexibility. As these skills improve, so can a child’s concentration, confidence, and self-esteem, ultimately benefiting a child in multiple aspects of their daily life. We are also very excited to be offering a family Baby Signing Time class. This class will follow the curriculum of Baby Signing Time. Brittany Dunn, our lead speech language pathologist, is a certified Baby Signing Time instructor. This class is targeted toward families and children under the age of 3 to assist in developing early American Sign Language vocabulary. Brittany will also be hosting a training for Milestone employees to learn and use simple ASL signs that can be used during therapy sessions, better improving our ability to server our kiddos. Class will target basic vocabulary as well as learning signs for different children’s songs. Please keep an eye out on our website, Facebook page, or in the clinic for more solid details as they become available! Feel free to email the Program Coordinator, Kaitlyn O’Brien, with any questions regarding our exciting new programs!